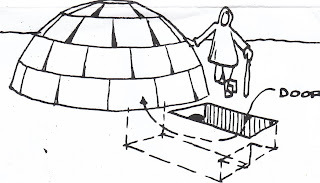 The igloo was developed by The Inuit Indians or Eskimos and was a semi-permanent shelter that was often built on the edge of the pack ice to shelter hunters for the hunting season (anywhere from 3 to 6 months out of the year). 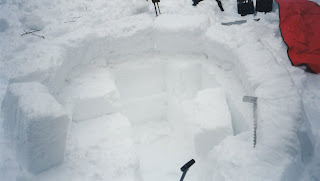 It was usually built with ice blocks using a saw. 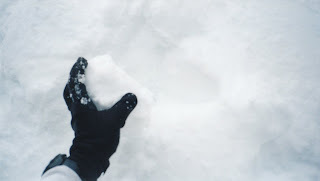 Therefore, it's not the most practical survival shelter and is the hardest to build and you definitely need packable or icy snow. 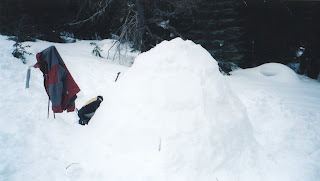 With that said, whenever you talk snow shelters, everyone always wants to learn how to build an Igloo. And with a few tricks they can be built quite efficiently. 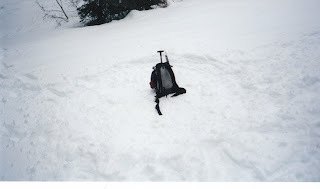 Just like the Quinzee you'll need to stomp out a circle about 6 foot wide (my pack is in the middle). 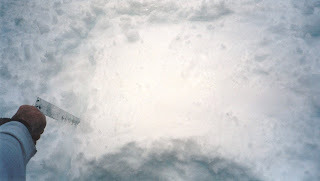 Also for an igloo you will need a block mining area, so stomp out another area about the same size and square. Here's what the mining area will look like later after you start taking blocks out (I put a tree branch in and the saw to give some contrast). Now cut the first block. 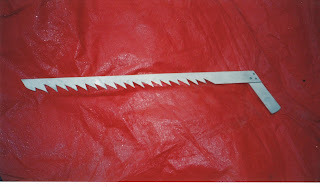 When it comes to cutting blocks a saw is easiest, but you can do it with a shovel and I've even seen people use a straight piece of plywood or even a stick. 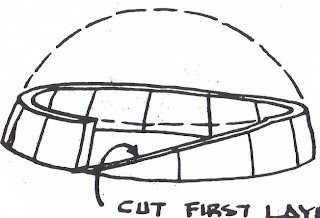 Set the first block on the edge of your circle, lean it in and cut it at a 45 degree angle from end to end. Here's the cut and I laid my glove on the top of the cut to give some contrast. Now cut whole blocks out of the middle and set them around the circle perimeter for your first complete row. Again, make sure you lean the blocks in, I just can't emphasize this enough, the first row is the foundation and if you don't lean them in you will never close the top. There's always three points of contact, the bottom two corners and the top corner that touches the last block set. LEAN, LEAN, LEAN! Remember that you must leave a bed and any other features you want as you cut blocks out. In this picture I'm leaving a bed and a shelf. The first complete row of blocks! Notice that I'm already two rows high and I've only finished the first row. That's what taking the blocks out of the bottom does, now only three more rows to go. Start the next row up the ramp and around. Finish setting the next two rows. Keep them leaning in and when you're done taking blocks out of the inside cut a door and get the rest of the blocks from your mining area. 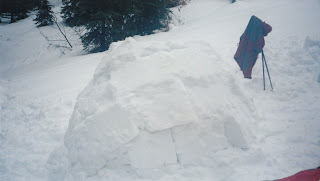 Notice that it's only three rows high compared to the traditional five row igloo. Again, that's because you're building down (by taking blocks out of the center) while building up. Here's the door cut out. Again make sure the top of the door is going to be a few inches below the bed for warmth. Also, I should probably mention my dog Jenna, she's not a bear just a black Lab that won't have any staying at home when there's adventure to be had in the outdoors. By the way the shelf in photo 3 of Step 5 was for her and the gear. Now it's time for the final block or cap stone block and if you've leaned the blocks properly you should be able to bridge this gap, if not you'll know. You've probably broken your share of blocks by now, but the last one usually takes a few broken ones to get it right, so don't despair. Here's a look at the hole to fill. 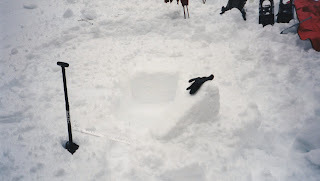 By now you've probably figured out that building an igloo is a lot easier with two or more people. Especially when you try to set the last block, but I did build this one by myself, other than Jenna barking at me to hurry up. So you can do them solo but it's nicer with two. 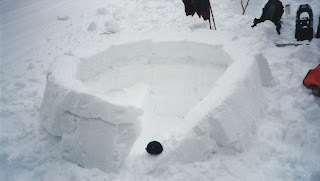 Now chink or put snowballs in the big holes and then shovel some snow on the outside to fill all the little ones. Punch a vent hole into the side about the size of a softball, at a 45 degree angle, halfway up the wall and not over your bed. 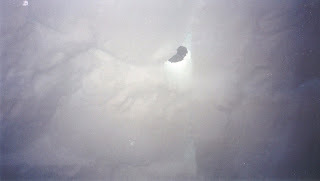 Here's the inside view of the vent hole. 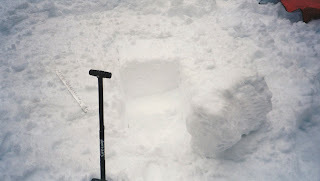 Igloo's are probably the hardest of the snow shelters to build, but also one of the most satisfying. Here's a picture of the finished product and my dog Jenna ready to climb in. 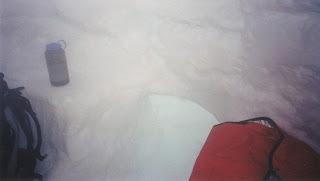 I'm looking up a pretty steep slope but photos never show the angle very well, so I'm down below the shelter. 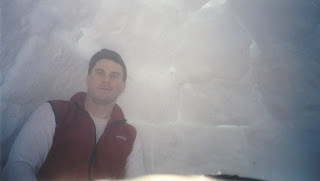 Here I am inside the igloo. You can see the outline of the blocks, make sure to smooth out any rough spots for dripping. There's also a lot of steam from working inside the shelter, it should settle when you slow down and it acclimatizes a little. Here's a view from my bed at the doorway (remember from the past posts on snow shelter criteria to make sure the top of the door is lower than the bed area) also you can see part of the shelf where my pack is and Jenna will sleep, along with a little shelf for my water bottle and a candle for a little more warmth (again look at the former posts). 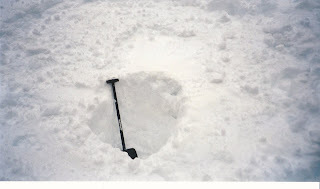 You can use a lot of things to cut blocks with such as a stick, snow shoe, board, shovel, etc... 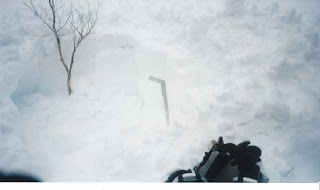 But a snow saw is sure handy. 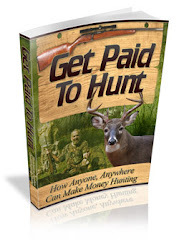 This is a picture of a homemade one that I used. Not Enough Lean. Remember Lean, Lean, Lean. 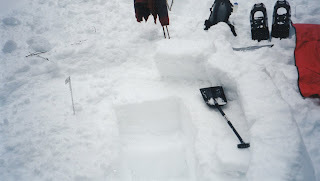 The most common mistake with Igloo's is not leaning the blocks in enough. Too Big. Remember, keep it small it requires less energy and it's easy to build. Jagged Ceiling. Smooth the ceiling to prevent drips. Doorway to High. 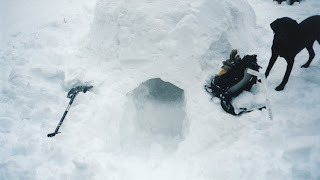 Remember to keep the beds higher than the top of the doorway to trap in heat, also make sure the door is not on the windward side and round. 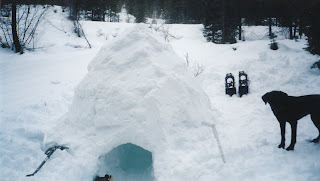 While Igloo's are not the most practical shelter to build in an emergency, they can be fun. Remember, a lot of people never practice their emergency skills or use their emergency gear until a true emergency happens. The only problem with that approach is that it's a bad time to find out something doesn't work or you're not sure how to do it. I can't count how many times a student broke one of those wire saws from their survival kits or had one of those 99 cent reflective blankets rip in half in the wind. I've always emphasized that my students use and test their skills and gear to find out what really works, so when the time comes that they truly do need them, they can count on them. Remember, "repetition is the mother of skill" and after you build a few you'll be an old pro.